Smart lights are nothing new. They allow you to control them from your smartphone. 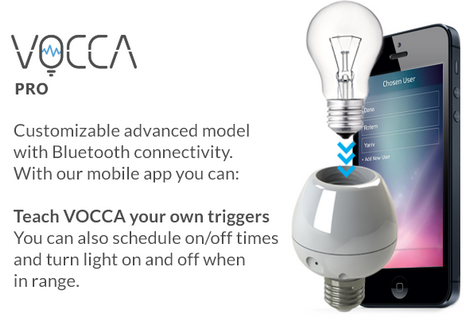 VOCCA happens to be a cool adapter that adds voice commands to any light bulb. All you have to do is screw your light bulb into VOCCA , connect the adapter into any light socket, and you are set. You will be able to activate your light using voice commands. The pro version adds Bluetooth connectivity, allowing you to create your own triggers and have your lights turn on and off as you enter and leave. VOCCA is based on voice recognition technology from Sensory. The VOCCA app lets you customize your adapter, manually control your light, and do more fun things. Like what you see? The developers are raising funds for the project on Kickstarter.